Tim Muller (in yellow shirt on left) and Mark Hay (in yellow shirt on right) yell across University Field after a good play by Missouri during a softball game on March 19. 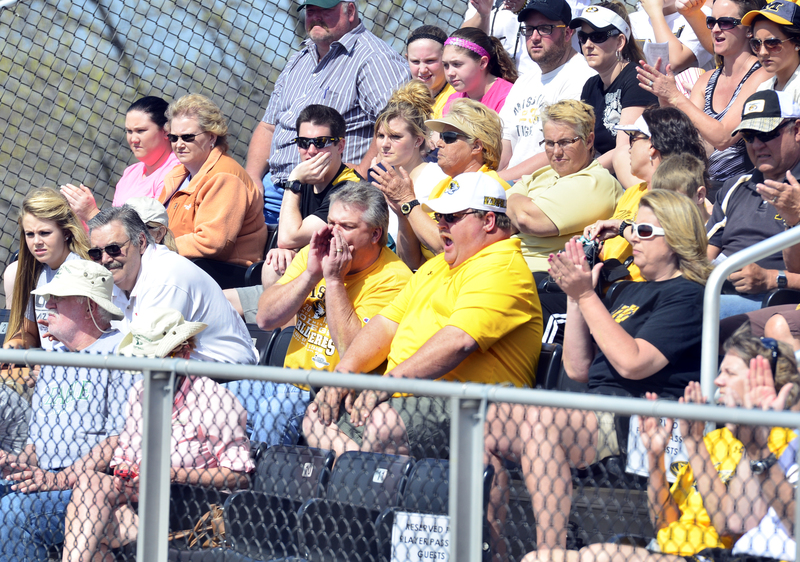 They are the loudest fans in the crowd at any Missouri softball game at University Field. Known as the “Heat and the Cheese Guys,” Tim Muller and Mark Hay have amplified the stands with their notable cheers for the past three years — the amount of time their daughters have played for the Tigers. Designated hitter/first baseman Lindsey Muller and catcher Rachel Hay are not the only ones who appreciate the enthusiasm. 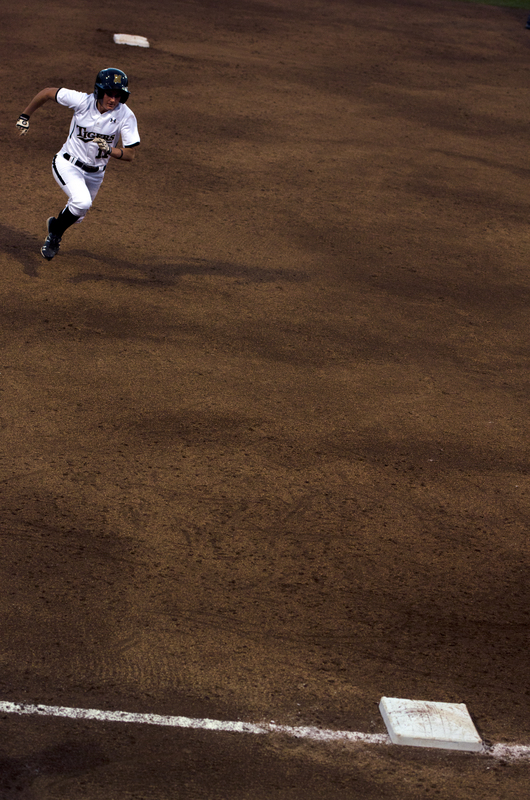 Freshman Kayla Kingsley advances to third base and reaches on a fielder's choice in a fifth inning play, March 21. She would go on to score for the Tigers and contribute to the 8-0 win over the Iowa Hawkeyes. Missouri Tiger bats were slow to make noise this series – but they wasted no time in Game 3. The Tigers blasted seven straight unanswered runs in the first two innings, completing the series sweep with a shutout over the Baylor Bears on Sunday, 7-0. This game extended Missouri’s home winning streak to 21 straight and moved the team to a 28-5 record on the season, 7-2 in Big 12 play. The Tigers managed a 4-2 win on Saturday and ended Game 2 eager for offensive contact earlier in the game. Freshman Kelsea Roth said Missouri batters modified their approach for Game 3. “We came up with a better plan today and we came out knowing what we need to hit and how to adjust, the adjustments we didn’t make for yesterday’s game,” Roth said. Roth went 2-for-7 with no runs and no RBIs in the first two games of the series, so she made some adjustments for Game 3 as she went. The adjustments were obvious from the first at-bat. Ashley Fleming began the four-run rally with a one-run double to right field to score Corrin Genovese. Roth then struck her fourth home run of the season to score Fleming. Lindsey Muller and Kelsea Jones finished the first inning with back-to-back singles. Muller scored on a throwing error. The Tigers loaded the bases again in the second inning and added three more runs for the early 7-0 lead. Jenna Marston, Genovese and Nicole Hudson were on base when Fleming singled for an RBI. Genovese later scored on a walk by Roth and Muller reached on a fielder’s choice to contribute the last RBI of the game. While Missouri batters kept swinging, pitcher Chelsea Thomas kept Baylor batters idle. She shut out the Bears with 10 strikeouts and allowed only two hits, improving to 14-3 on the season. Tiger heads now turn to a big three-game series against the No. 6 Texas Longhorns in Austin, beginning Thursday, April 5. Before the sixth inning, the Missouri Tigers only had two hits – until their bats came alive. Hudson hit a grand slam that swung the Tigers ahead to a 4-2 victory in Game 2 over the Baylor Bears. The Bears scored first with a two-run homer by pinch hitter Shelbi Redfearn in the top of the fifth inning. The Tigers closed the inning scoreless, leaving them anxious to retaliate. In the bottom of the sixth inning, Ashtin Stephens sparked some hope with a single to left field. Corrin Genovese then struck out swinging, but back-to-back walks by Jenna Marston and Ashley Fleming loaded the bases for Hudson’s grand slam. She also said the Tiger offense needs improvement for Sunday’s game. “I think everyone wants to come out swinging and come out with a plan and jump on them a lot earlier. We should have hit a lot better than we did today, but I think we’ll make up for it tomorrow,” Hudson said. Kristin Nottelmann started off for the Tigers on the mound and threw little for the Bears to bite. “One of Baylor’s general weaknesses was hitting the change-up and I think it worked perfectly today,” Nottelmann said. She pitched five and one-third innings and struck out four, allowing four hits and two earned runs. Bailey Erwin relieved Nottelmann to close the sixth and allowed only one hit. Chelsea Thomas then came in for the save in the seventh. With two wins in the three-game series, the Tigers look to complete the sweep over Baylor in Game 3, Sunday at noon. “Anything less [than a sweep] is a disappointment,” Hudson said. If Missouri takes the third win, they would extend their home winning streak to 21-straight and bolster momentum into a pivotal series against No. 6 Texas starting April 5. Three Missouri Tiger home runs, including a Lindsey Muller grand slam, lit up the scoreboard in Game 1 of the three-game series against Baylor, Friday, March 30. The Tigers took the 6-1 win, scoring all runs off the bats of Nicole Hudson, Corrin Genovese and Muller. After a quiet first inning, Hudson and Genovese put Missouri on the board each with solo homers in back-to-back innings. Both hit their third home runs of the season. They made their hits count as Hudson went 1-for-3 with one run and one RBI and Genovese went 1-for-2 with two runs and an RBI. Muller blasted her fourth season home run with a grand slam in the sixth inning. A Genovese walk, followed by singles by Jenna Marston and Kelsea Roth loaded the bases for the four-run rally. Muller went 1-for-3 on the game. Chelsea Thomas delivered from the mound with seven strikeouts and allowed only three hits in five innings. Bailey Erwin relieved Thomas in the sixth inning and allowed one unearned run in two innings. She closed the game with three hits and one strikeout. The Tigers improved to a 5-2 record in conference play and a 26-5 record overall. Game 2 starts at 3:30 p.m. on Saturday at University Field. No. 19 Texas A&M served up some solid competition, defeating No. 10 Missouri softball team in a tight three-game series at College Station. Missouri ended their 17-game winning streak in Game 1 Friday with a 2-1 loss, but hope struck when the Tigers took the 6-5 win in Game 2. Game 3 went seven innings without a run and ended the game with an Aggie run in the bottom of the eighth. The Tigers simply could not deliver from the plate as Aggie pitcher Mel Dumezich took control of the game. Dumezich proved to be a threat from the mound and at bat in the first game; she issued seven strikeouts and contributed two runs with the game-winning home run in the first inning. Tiger Kelsea Roth contributed the only run for the Tigers with a double to center, scoring Corrin Genovese. The Tigers managed four hits to counter Dumezich, but it was not enough as they fell 2-1. Dumezich allowed just enough leeway in Game 2 for the Tigers to capitalize and take the win. After Roth doubled to score Jenna Marston in the first, the game came alive in the second inning as the Tigers added five runs. Genovese doubled to left field, scoring Princess Krebs and pushing Ashtin Stephens to scoring position. Marston then singled and sent Stephens and Genovese home for a 4-0 lead. Later, Roth hit a double to left field and sent Marston home and Ashley Fleming to third base after she drew a walk. Fleming then scored an unearned run to close the inning. Two outs into the second inning, the Aggies sent in Lauren Ainsley to relieve Dumezich. Missouri responded with five runs against Ainsley, ending the second game with a tight 6-0 Tiger victory. It was the battle of the pitchers in the series closer. Missouri’s Chelsea Thomas threw seven and one-third innings allowing only two hits, one error and the game-winning run, while Dumezich allowed just one hit to Genovese in the third inning. Combined, the pitchers kept the batters quiet for seven full innings until Aggie Jenna Stark hit a double to score Cassie Tysarczyk for the win in the extra inning. Genovese and Roth led the Tigers in hitting, contributing a combined eight hits on the series – but the team recorded only 11 hits on the series, six of them from game two. Thomas is now 11-3 on the season and the Tigers fall to 23-5 overall, 4-2 in conference play. Missouri will return to Columbia to host a doubleheader against the Evansville Aces on Wednesday, starting at 3 p.m.
Society has an array of unwritten rules for dating relationships – but for Caleb Hoke and Allison Braun, defying some of these general practices has come naturally. Hoke, a sophomore photojournalism major, and Braun, a senior majoring in English and women studies, live together in a one-bedroom apartment in downtown Columbia. They met after a Mizzou LGBTQ Resource Center event Hoke’s freshman year and have been together for just over one year. Hoke leads a transgender discussion group with the Resource Center and Braun helps more with event logistics and training. Despite the age difference, the couple says they’re practically the same person because they spend so much time together and share a sarcastic sense of humor. Although Braun graduates in May, they plan on sticking together. With two wins on Sunday, the No. 12 Missouri softball team took a three-game series from Big 12 rival Kansas by a combined score of 24-0. The games took the all-time border war record to 63-40 in favor of Missouri. The Tigers have recorded seven straight shutout victories and are on a 14-game winning streak. They have only allowed three runs over the 14 game span. Overall, the Tigers are satisfied with how they ended the era. “We definitely wanted to come out and show them how good we are. Go out on a good note,” senior Ashley Fleming said. “I don’t know if they’ll end up playing them in the regular season next year or not, but conference-wise this is the last time, so I don’t think we could’ve done it any better than we did. Kansas struggled to respond to the 24 Missouri runs on the series and could only deliver 10 hits. Kelsi Jones and Fleming led the Tigers. Each player recorded game-ending home runs in run-rule victories. Jones finished the series with a team high six RBIs, two runs and two hits. Fleming went 4-for-11 with three runs and three RBIs. Jones contributions were clear on paper, but her teammates also took notice. In the first game of the doubleheader, Chelsea Thomas threw a shutout. The win improved her record to 10-0 on the season. Jenna Marston and Fleming each went 2-for-3 and scored one run each. Lindsey Muller added two RBIs on one hit. The Tigers took an early three run lead in the first inning. Corrin Genovese drew a walk and advanced to second on a line drive from Fleming. Nicole Hudson then reached first on a fielding error by Jayhawk first baseman Marissa Ingle and advanced to second. Genovese scored an unearned run on the same play to put Missouri on the board. A wild pitch by Alecia Pille allowed Fleming to come home for another unearned Tiger run. The pitch put Hudson in scoring position. Muller closed the inning with a sacrifice ground out to shortstop Mariah Montgomery to score Hudson. The game slowed down until the bottom of the fourth inning. Marston singled up the middle and advanced to second after Genovese was hit by a pitch. Muller recorded her second RBI scoring Marston with a single to left field. In the fourth inning, Mackenzie Sykes singled to right field and advanced to third off an Ashtin Stephens double. Sykes added another Tiger run when Jenna Marston grounded out to second base. Kristin Nottelmann pitched a season high six shutout innings. Nottelman struck out seven batters and allowed only two hits. This win improved her record to 6-2. Fleming and Jones led the game with three RBIs apiece. The Tigers churned out six runs in the bottom of the third inning, while the Jayhawks struggled from the mound. Kansas pitcher Morgan Druhan issued a walk to Genovese and pushed Marston to second. Fleming then smacked a line drive double deep into center field, scoring Marston for the first run of the game. Druhan then issued walks to Hudson and Muller that scored Genovese and loaded the bases. A sacrifice fly by Princess Krebs sent Fleming home for a 3-0 lead before Jones homered to right field. Krebs gave Mizzou a 6-0 advantage. The score would remain at 6-0 until the bottom of the sixth inning. The Tigers looked for just two runs to end the game. Marston added one when she doubled then scored off a hit by Angela Randazzo. Then, in similar fashion to the game-winning home run by Jones in game one of the series, Fleming homered to right field for two RBIs and closed the game 9-0. “It felt good. It was good to end the weekend on a hit like that,” Fleming said. Missouri now sits at a 20-3 and 3-0 in conference play. The Tigers take on Iowa in another doubleheader on Wednesday at 3 p.m.